Mix your dry ingredients in one bowl and use a wisk to make sure everything is blended well. Mix the wet ingredients in another bowl. Next you will work fast to take full advantage of the baking powder/soda chemical reaction. Add the liquid ingredients to the dry ingredients and stir until everything is incorporated, but do not over mix. Place immediately in your greased bread pan or one lined with parchment paper. Smooth the top with a wet rubber spatula, grease a sheet of foil and then cover it. Place it in the middle rack of your oven. Bake at 350 for 50 minutes. (325 if you have a glass bread pan) Uncover and bake for another 10 minutes. It should register 206 degrees inside. This bread has brown rice flour, white rice flour, sorghum flour, potato flour, potato starch, tapioca starch, and millet flour. Each flour adds something to the bread, and I think it’s worth making the gluten free flour blend. I keep a ziplock bag in my pantry and use it all the time. Here is a good article about the different flours. If you miss the flavor of yeast you can easily make this with it. Just leave out the baking powder and soda. Heat the water to 110 degrees and add 4 1/2 teaspoons of yeast and a teaspoon of sugar. Let it sit for 10 minutes before you add your wet and dry ingredients together. After everything is mixed together pour it into a greased pan and smooth out the top with a wet rubber spatula. Spray a sheet of saran wrap with cooking spray and cover the bread. Place in a warm place for 1- 1 1/2 hours. (a warm place: preheat your oven to 170 degrees and then shut it off before you place your bread inside to rise.) Then bake the same way listed above. 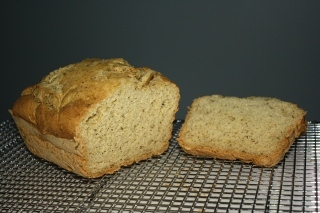 2 Responses to "Gluten, Yeast & Dairy Free Bread"
All of your resent breads were truly amazing. The taste and texture definitely fooled me if I had not know they were GF! These were way better than not only any store bought GF bread but also better than regular bread. I think this is a great substitute for regular bread for many reasons. The rise out of that bread is amazing!!!!! I can’t wait to make this for Gideon, Jade and I!!!!!!!!! Even Ruby is eating mostly gluten free now too since that is all that is in the house lol! She eats the Udis bread though while Jade, Gideon and I eat the yeast free bread. That bread is just so pretty!!! !